Creating a diet for an athlete necessitates an understanding of the fuel source most appropriate for your dog’s activity and the duration of activity. You can get there in a variety of ways and by feeding any number of foods. A diet based primarily on meat, bone and green vegetables might be fine for a dog expected to perform broad jumps, high jumps or weight pulls. If the same diet includes plenty of fat, it might be fine for the hard-working hunting dog. On the other hand, a dog expected to excel in agility is unlikely to perform as well if fed this kind of diet. Agility performers and many other dog sports that use multiple short bursts of energy make good use of glucose and glycogen. Glucose will outlast energy from glycogen stores but it yields less power than glycogen does. Glucose is a major source of energy for dogs that need to work for only a few minutes, but in combination with glycogen, you’ll see more of a powerhouse. This is where complex carbohydrates in the daily diet can help the agility star become a super-star. A dog that works hard on a farm is a true working dog, and like his or her actively hunting cousin, will make use of dietary fat more than most other dogs. It’s these dogs that can usually do with less carbohydrate in the diet. 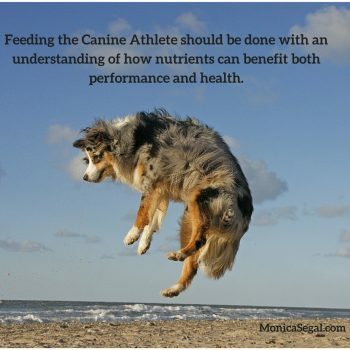 Remember that nutrition is an important component in the success of a performance dog but so is appropriate training and exercise (and conformation) to avoid injury. Keep your individual dog in mind and the performance that they are capable of giving rather than comparing him or her to another dog. A personalized -balanced per NRC- homemade diet is an important first step, and with our new proactive consultations it’s even easier to get started.